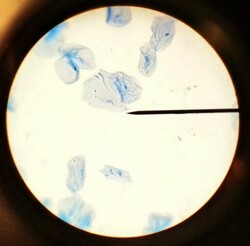 Cheek cells are fairly easy to observe, simply take a flat toothpick and rub it on the inside of the cheek. Swirl the toothpick in a drop of methylene blue on a microscope slide. Place a coverslip on the slide and view with a light microscope. 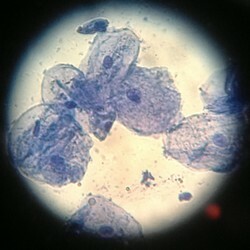 Cells from the cheek are a type of epithelial cell, similar to skin. They can be seen faintly even at 40x (scanning power), but the most dramatic images are at 400x where the nucleus is clearly visible as a dark spot in the center of the cell. If you don't have access to a lab, you can place the supplies needed in small trays. Methylene blue can be ordered from supply companies, and it is necessary to view the cells. Without stains, cells are mostly transparent. 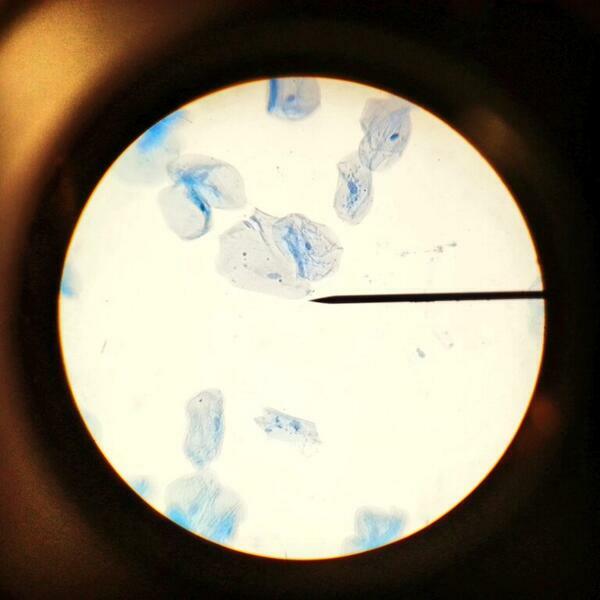 Cheek cell photo taken with a cell phone - it takes a steady hand to line up the camera just right! Take a #cellfie and share it on social media! 1. Wash the underside of a wrist that will be sampled for epidermal cells with soap and water. 2. Stick a clean piece of clear tape on the underside of the washed wrist. 3. Gently remove the piece of tape from the wrist being careful to avoid getting fingerprints on the tape. A forceps might help to remove the tape and avoid fingerprinting the tape. 4. Place the tape, sticky-side up, on a clean microscope slide. 5. Stain the top, sticky side of the tape with 2 or 3 drops of 1% methylene blue solution.